Springtime is on the way in Milwaukee. The snows are melting a dirty trickle in the rain. The chartered buses are revved up for the state high school sectionals. March Madness is in the air. And the Bucks playoff seeding rests (in part) on how well they fare in games against the Philadelphia 76ers and Boston Celtics. Celtics-Sixers, Sixers-Bucks, Bucks-Celtics — a weekend round-robin that began tonight in Philly — harkens (albeit vaguely) back to the NBA’s Golden Age when Larry Bird‘s Celtics, Sidney Moncrief‘s Bucks and Dr. J‘s Sixers waged battle season after season for home court advantage in the Eastern Conference. To be a fan of coach Don Nelson’s Bucks was to worry about your team’s health every spring and fret over the strength of the opposition, the names Bird, Erving, Bobby Jones, McHale, Moses muttered under the breath in curses. Bucks fans cringed at the inevitable playoff disappointment against arguably the two best teams ever assembled in the NBA. 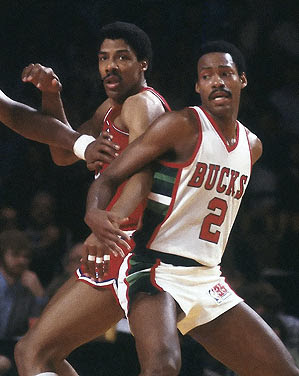 But the Bucks in those days had Moncrief and Marques Johnson and Bob Lanier, and later Moncrief and Terry Cummings and Paul Pressey. There was always hope. The stakes aren’t so high for our Bucks these days. They are a disappointing 25-38, a far cry from the Bucks teams that chased 60-win seasons during Moncrief’s prime. Yet the 2011 Bucks find themselves gaining ground in the mad stumble for the 8th and final playoff spot in the East, one game out as they face the Sixers Saturday at the BC and go to Boston Sunday to meet the Celtics. The Celtics are hanging on to the top seed in the East with Derrick Rose’s Bulls hot on their heels. The Sixers are in 7th place, out of the Bucks reach and looking to move up a rung or two on the East playoff ladder. This Philly-Boston weekend is critical for Bucks as they work to establish some late consistency and salvage the season. Eighth will have to do for Bogut and the Bucks this season. And, no, the names Bogut, Garnett and Brand don’t resonate like those of Erving, Bird and Moncrief, who will be on hand Saturday providing color commentary for the Bucks’ FSN broadcast. But spring is almost here in Wisconsin, and this will have to do. Eighth was good enough for the Chicago Bulls in 1986, Michael Jordan‘s second NBA season, the year he missed 64 games with a broken left foot. It will be good enough for Brandon Jennings in his sophomore NBA season, a year in which he, too, broke his left foot. Jordan’s 1986 Bulls, also featuring rookie Charles Oakley and Orlando Woolridge in his second season, are worth mentioning here because whoever grabs the 8th seed in the East this season will surely make the playoffs with one of the worst records in recent memory. The worst NBA playoff record, post-ABA merger, belonged to the 1986 Bulls, who won just 30 games playing in arguably the toughest conference that the NBA had ever put on the nation’s courts — the Eastern Conference of the mid-1980’s. How good was the 11-team East in 1986? The young Bulls went 3-15 against the Celtics, Sixers and Bucks. There were Dominique Wilkins‘ Hawks and Isaiah Thomas‘ Pistons to contend with, too, and the Bulls were just 3-9 against them. The Western Conference champions, the Twin Towers Houston Rockets starring 7-footers Hakeem Olajawon and Ralph Sampson, would fall in six games to the Celtics in the 1986 NBA Finals. The Rockets, with the luxury of playing in the West, finished 51-31 (#2 in the West behind the Lakers) but won just 3 of their 10 games against the Beasts of the East. The Rockets would very likely have finished 6th in the East, and no better than 5th. Playoff atmosphere in Philly. The Sixers kicked off the Boston-Philly-Milwaukee round-robin by holding off the Celtics, 89-86, snapping a seven-game home losing streak to the Celtics. Center Spencer Hawes, forward Elton Brand and swingman Andre Iguodala led a balanced Sixer attack that ended with five players in double figures. The Celtics were led by Jeff Green (18 pts) and Nenad Krstic (16 and 15 boards)? No, these are not the Celtics and Sixers of the great Bird and Dr. J rivalry, but the Wachovia Center crowd roared playoff intensity nonetheless as Iguodala waltzed through the lane for the game-clinching layup. Ray Allen had perhaps his worst game this season, scoring only 5 points on 2-11 shooting. The Celtics have lost two in a row. The Sixers are playing their best ball since Allen Iverson’s heyday for coach Doug Collins, and moved to within a half game of the Knicks for 6th place and three games back of the Hawks in 5th. The Hawks looked downright sick losing by 18 to the Carlos Boozer-less Bulls in Chicago. “All-Star” Al Horford contributed 6 points and 7 rebounds in the loss. Did I mention that the Bulls power forward, Carlos Boozer, didn’t play? I watched Hawks-Bulls a second time, late night. The Hawks simply turned dumb and selfish when faced with the in-your-face Bulls defense, just as they do when playing the Bucks. They don’t like being challenged, and, even though Kirk Hinrich just joined the team, they looked completely lost when he wasn’t on the court. They switched and had bigs guarding Derrick Rose in the 3rd quarter, same way the Mike Woodson Hawks of last season played Brandon Jennings. That was a miserable failure. Luol Deng got hot, and the Hawks had no one to guard him. Josh Smith and Joe Johnson made horrible decisions on offense, repeatedly, Al Horford disappeared, and Jamaal Crawford and Kirk Hinrich seemed like the only guys interested in playing the game. Zaza Pachulia was, as usual, a useless hack who isn’t too effective when a stronger player (Kurt Thomas) is matched up against him. It was games 3, 4, and 5 last May all over again, with the Bulls dominating like the Bucks never could have without Bogut. Bucks play the Hawks in Atlanta Tuesday, and that game looks very winnable. This entry was posted in Bucks History, Bucks Weekend, NBA Playoffs, The Jinx and tagged 1986 NBA Playoffs, 2011 NBA Playoffs, Al Horford, Andre Iguodala, Atlanta Hawks, Bobby Jones, Boston Celtics, Chicago Bulls, Derrick Rose, Dominique Wilkins, Don Nelson, Elton Brand, Hakeem Olajawon, Houston Rockets, Isaiah Thomas, Jeff Green, Julius Erving, Kevin Garnett, Kevin McHale, Larry Bird, Michael Jordan, Moses Malone, Nenad Krstic, Philadelphia 76ers, Ralph Sampson, Ray Allen, Sidney Moncrief, Spencer Hawes on March 12, 2011 by J.D. Mo. What did the Milwaukee Bucks ever do to the Philadelphia 76ers? Was it drafting Julius Erving in 1972 when he didn’t want anything to do with Brewtown, and, a few years later — preventing the Hawks from signing him out of the ABA? Or was it drafting somebody named Russ Lee six picks before the Doctor? Did the Bucks commit some cosmic offense to the basketball gods in the first round of the 1987 playoffs when they failed to close the Sixers out in Philly, moving the Dr. J retirement party to the Bradley Center — ensuring that the Doctor would suffer his final loss in front of Bucks fans? Didn’t Doc owe us at least that, small enough consolation though it was for the pain and suffering he and Bobby Jones and Mo Cheeks caused in the 1981, ’82, ’83 and ’85 playoffs? Iverson went on to score 30 opening night, 1996, but the Bucks won the game, 111-103 and took the season series 3-1, then winning the first two the next season in Larry Brown‘s first year as Sixers coach. But Brown and Iverson turned the tables in the remaining two 1998 Bucks-Sixers games, then went 9-4 over the next four season, beating the Sam, Ray & Dog “Big Three” teams 7 out of ten times. If the Iverson-Ray rivalry was on — and it was — advantage Sixers. Nothing screamed this louder than the bitter 7-game 2001 Eastern Conference Finals, still the NBA standard for crooked refereeing. Most of the shady stuff occurred in Philly but Game 4, the crucial game that would have put the Bucks up 3-1, was hijacked at the BC in a blur of calls and non-calls as the walking wounded Sixers were given new life. The series would live on in infamy, tarnishing Shaq’s 2nd title in LA if only the East Finals were more well-remembered. But they’re not. One of the NBA’s greates travesties wasn’t left on the cutting room floor of ESPN columnist Bill Simmons’ The Book of Basketball (publ. fall 2009) — Simmons simply forgot it. That’s OK, Bill. The Bob Boozer Jinx remembers. Since Iverson dropped 5 of those first 6 games against Ray Allen, the Sixers are 28-15 vs. the Bucks, with many of the Answer’s career highlights achieved at Milwaukee’s expense, including a 45-point masterpiece in a 124-120 OT win in Philly, Jan. 3, 2000. For a few years, Iverson held the record for most points by an opponent at the Bradley Center (broken last season by Lebron James), dropping 54 on Michael Redd and Mo Williams, good defenders that they weren’t, more interested in filling up their own box scores than stopping AI from filling up his and winning the game. It was pure streetball that night at the BC, and Iverson was worth the price of admission. There was a down season for the Sixers against the Bucks after Brown quit and resurfaced in Detroit, and another in Iverson’s last full season in Philly, when he took one look at the rookie Andrew Bogut and realized that Ray Ray probably hadn’t been a Buck for years. The rivalry had become one-sided. The airball had been avenged, and it probably should have ended there, in Dec. 2006, when Iverson was traded to Denver for Andre Miller. But it didn’t end there, and lately, the Revenge of the Airball has hit the Bucks hard: the Sixers have won 8 out of the last 10, and had won six straight until the Bucks 91-88 victory Jan. 27, very likely the Answer’s last game ever on the Milwaukee court that has been so kind to him. I was there to see it, and though Iverson gave way to Louis Williams in the 4th quarter, I caught a basketball high watching AI chase Brandon Jennings all over the court, both of them wearing #3, the young Buck honoring the old Sixer, his hero. I also believed I was witnessing the breaking of the Sixers’ spell. When Iverson left the team a couple of weeks later for personal reasons and didn’t come back, and the Bucks went on a 15-2 tear after acquiring John Salmons, I was sure it was over. Boy, was I wrong. Wednesday night the Sixers, a dismal 24-47 and without two of their best players, Williams and Thaddeus Young, blew the Bucks out of the Bradley Center. Willie Green (16 pts) couldn’t miss until his team was up by 20. Rookie point guard Jrue Holiday (15 pts) proved unguardable for Jennings and Luke Ridnour. Center Sam Dalembert, as usual, locked down Bogut, with some help from 2nd-year big man Marreese Speights, and Dalembert was almost perfect under the basket for 12 pts, 10 rebs. Andre Iguodala played lock down defense on Salmons and was off to the races in the open court, where Iggy’s Sixers teams are at their best. Power forward Elton Brand, who’s done most of the damage for the Sixers vs. the Bucks this season (also singled out as the force of gravity slowing down Iggy and the gang since becoming a Sixer) didn’t have to break a sweat or make more than a shot. Brand was 1-7 from the floor in 27 uninspired minutes, while the Sixers young guns had a blast. Jodie Meeks, traded by the Bucks a month ago with Francisco Elson to the Sixers for Royal Ivey, Primoz Brezec and a draft pick, got into the act with 7 pts. The Bucks managed to make up a few points in garbage time for a 101-86 final. 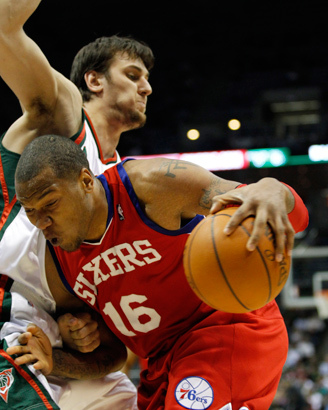 Clearly, the Sixers’ mastery over the Bucks has extended beyond the corn-rowed one and the rivalry of a decade ago. Iverson was in Denver and Detroit and Memphis for the eight most recent Bucks losses, make that nine. The Sixers are now 9-3 vs. the Bucks since trading Iverson to the Nuggets, while going 127-155 (.454) against the rest of the NBA. But coach Maurice Cheeks had figured out that speed and nasty defense could be tough on the slow-footed Bucks, even as the detrus of Iverson and the rivalry remained, infecting his teammates with the necessary Buck-beating mojo. Iggy got it, and there was Dalembert (who seems to enjoy his matchup against Bogut). Guards Williams and Green were on those teams, and it infected Thad Young when he came along the next year. Now it seeems to have Holiday and sharpshooter Jason Kapano, too, after playing with Iverson for only a month. And, hey, look who’s back from a one-year exile in Minnesota — forward Rodney Carney, a Sixers rookie during the trade year. Carney killed the Bucks last year in a game at Minnesota, with 22-points and a 4th quarter 3-point barrage. 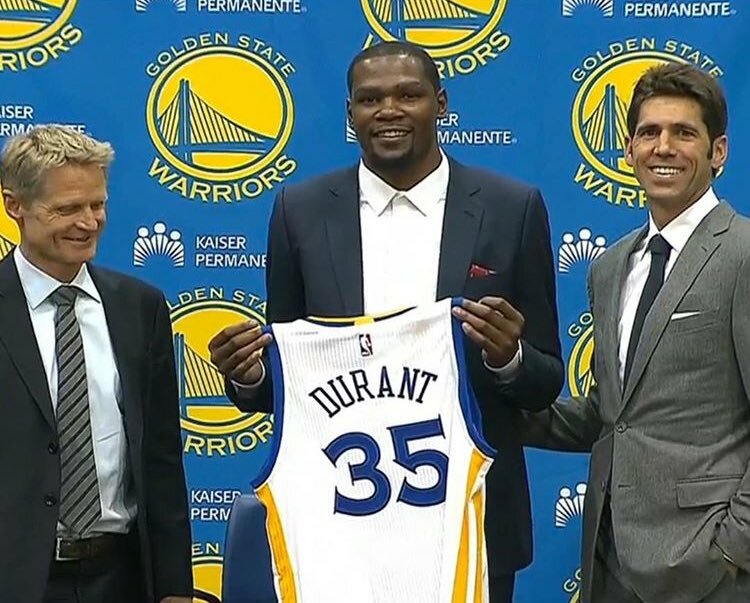 I could mention ex-Sixer Kyle Korver here, too, but that would be redundant. There is something to this Sixers hex, the Philly jinx. The Revenge of the Airball. If the fact that Wednesday’s loss was clearly beyond the red-hot Bucks’ earthly control wasn’t enough, take a look at how one other Sixer from those post Brown-Iverson teams did in the game. He’s on the Bucks (for now), and on Monday scored 32 in a classic 4th quarter shootout with the Hawks’ Joe Johnson. 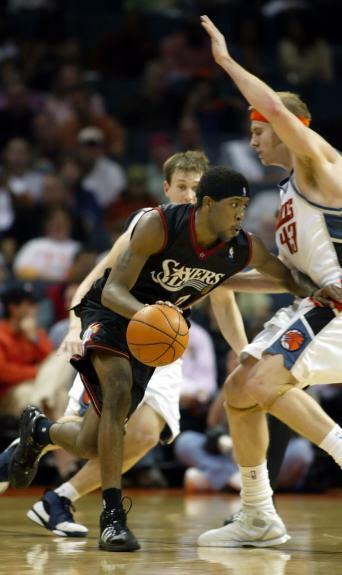 Yes, the Bucks salvation at shooting guard, John Salmons, predated even Dalembert in Phlly, playing his rookie year in Brown’s final Sixers season. Salmons played four years with Iverson under five different coaches (Cheeks the last one) shooting the ball five or six times a game off the bench if he was lucky. Salmons was 2-12 Wednesday night in 30 mins against the Sixers and the hex, the Revenge of the Airball. 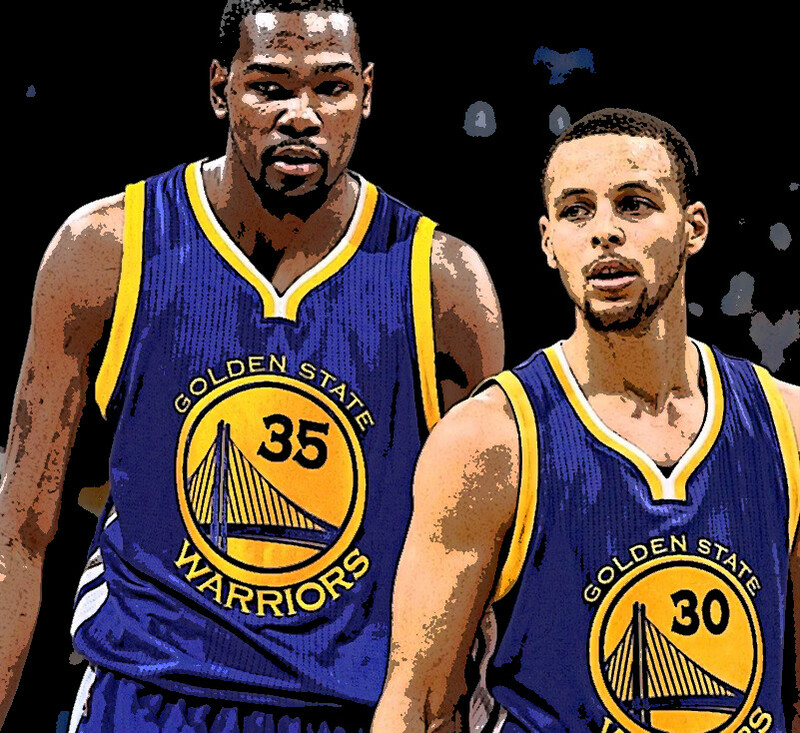 He finished with 4 pts and as many turnovers (1) and fouls (2) as rebounds (1), assists (1) and steals (1). That airball of Iverson’s just never seems to get enough revenge. C) Both A and B are true, and Larry Brown certainly wasn’t about to let Stack slash the tires on the Iverson-mobile. This entry was posted in Bucks History, Essential Reading, Jinxes & NBA Mojo, The Jinx and tagged 2001 Playoffs, Allen Iverson, Andre Iguodala, Andrew Bogut, Brandon Jennings, Charles Barkley, Charles Barkley arrest, John Salmons, Jrue Holiday, Julius Erving, Larry Brown, Milwaukee Bucks, Mo Cheeks, Philadelphia 76ers, Ray Allen, Sam Dalembert, The Revenge of the Airball, Willie Green on March 25, 2010 by J.D. Mo.